WE BIKE, etc. 2019 Bicycle Adventure | WE BIKE, etc. As you probably already know, we will be riding our tandem bicycle (“Violet”), unsupported, across the country again in 2019. We plan to ride way more miles than our past trips, approximately 7,000 over five months. Our route will take us from Washington State in June, east across the middle of the country to the eastern seaboard, where we will ride from Massachusetts to Florida, Alabama, and Mississippi, ending in New Orleans, Louisiana in late October. This will be our longest trip yet and will cover our final 21 states in the lower 48! This trip was my idea, but Peter was quick to jump on board! While looking at our past adventures map, I noticed we only had 21 states to bicycle through (white states on map) to hit all 48. Silly me, the 21 states are not all connected, so to make the trek we will actually travel through 31 states. Yikes! We will begin the adventure in Bellingham, Washington on June 1st, heading as far south as Sacramento, California. We will then turn our bicycle east toward the mountains. Nevada, Utah, and Colorado are our next challenges. Plans are to meet up with our daughters in Denver, Colorado for a short break. Then we will hit the corner of Wyoming (Cheyenne). Nebraska, a less mountainous state, will be a welcome change. We will cross the southern portion of the state, traveling near Interstate 80 and the Platte River. Here we hope to visit some of the same places Peter’s ancestors saw while traveling along the Oregon Train in 1865. Cool, right! From Omaha, Nebraska we will head north to Sioux City, Iowa and Sioux Falls, South Dakota. A ride across the southern portion of Minnesota, and past Peter’s birth place, Albert Lea, Minnesota, will bring us to La Crosse, Wisconsin, where I went to college. A few days later we will arrive home, Green Bay, Wisconsin, for a short (but I am sure much needed) break. After recovering a bit, we will continue to the east coast. We will bicycle down to Manitowoc, Wisconsin and hop on the S.S. Badger Lake Michigan Car Ferry. The Badger will take us across the Great Lake to Ludington, Michigan. From Ludington we will head south to Indianapolis, Indiana, east to Cincinnati, Ohio, and then into Kentucky. After checking out Louisville and Lexington, Virginia, a short jaunt into West Virginia will fill our days. From the Atlantic Coast, we will head up to Boston, Massachusetts. After exploring Boston and visiting some Warm Shower friends, we will travel south to hopefully out run the cold weather. Rhode Island, New York, New Jersey, Pennsylvania, and Maryland will all provide challenges and adventures as we navigate their big cities. The states of North Carolina, South Carolina, Georgia and Florida will complete our south bound travel. The Panhandle of Florida will be the beginning of our west bound journey. Travel through Alabama, Mississippi, and Louisiana will bring our journey to a close. Our final destination, New Orleans, Louisiana will hopefully include a meet up with our youngest daughter, Alexandra and her boyfriend Ethan, who plan to travel from Texas to help us celebrate. We will head back to Green Bay after a short stay in New Orleans. No, we will not bicycle home, Amtrak will provide a ride for us and our bicycle to Milwaukee, Wisconsin. We will meet up with family for our return trip to Green Bay by car. Follow Us! Once we start our adventure we plan to post daily on this blog and hit the highlights on our other social media sites (Facebook, Instagram, LinkedIn and Twitter). Follow us, and reach out to let us know you are there. We get lonely on the road and a hello from friends and family definitely brightens our days. We are frequently asked how we are able to take so much time off? One of the key elements is being “financial fit”. Our Investment Adviser, Richard Balch has helped us to get fit. If you are looking for a way to take on your adventure, contact Woodmen Financial Resources to get started. Woodmen Financial Resources provides comprehensive wealth management for families and small businesses. They are located in Green Bay, Wisconsin and have a staff of three advisors and three team members who serve as resource partners to their clients. They help them attain their financial goals which may include: retirement planning, income distribution strategies, tax planning, legacy planning, college funding, risk planning, and investment advice. The firm has been in the community for 80 years, originally as a life insurance agency and evolved to financial planning in the late 1980’s. Wello folks! This is the first of periodic “guest blogs” Wello will be posting on the WE BIKE, etc. blog. The goal is to use Peter and Tracy’s upcoming epic adventure to bring attention to some of the groundbreaking work our community is doing in the area of well-being. And, hopefully, to give them a little break from writing while they’re on the road. Wello, in case you don’t know, is a local non-profit dedicated to growing well-being for all in Greater Green Bay. We’ve worked for years with WE BIKE with the goal of making Greater Green Bay a more active and connected community. Peter and Tracy’s expertise as nationally recognized bicycle and pedestrian experts has been invaluable in a range of projects from advocating for year-round access on the Fox River Trail to making a dodgy stretch of Hoffman Road safer for cyclists and more. Suffice it to say we were thrilled when WE BIKE invited Wello to be their local non-profit partner for their Bicycle Adventure 2019! What do a non-profit and a tandem bike team have in common? One thing is a shared desire to promote well-being. Well-being is a holistic view of health that reaches well beyond the purely physical to acknowledge the power of positive mindset, a sense of purpose, community connection and teamwork to enhance our quality of life. Another is our shared belief that real personal and community development happens when we step outside our comfort zone. Not to crush on WE BIKE too hard, but one of the most inspiring things about their 2019 Bicycle Adventure is the sheer audacity of the vision. And their confidence that with careful planning and dedicated training, their team of two can get it done. Wello’s vision for Greater Green Bay is a big one, too. Having partners that lead by example and reach for the stars emboldens other well-being leaders to step forward and do the same. Another thing we find fascinating is the team dynamic involved in riding tandem. When we asked Peter and Tracy to share a few trade secrets about tandem cycling, they had some interesting insights about the importance of what they call a “good base” for collaboration. As tandem cyclists, a good base means good nutrition, optimal rest and a positive mindset so they can show up for each other and work hard. Equally important, they stress, is the lived experience and trust that comes from getting on the bike together time and again. Peter and Tracy both noted how that element of showing up for each other pushes them out of a comfort zone (where it’s all about “me”) into a place where it’s about “we,” that includes solving problems, listening and finding consensus. Finally, the 2019 Bicycle Adventure is simply a great story that shows our community in a truly admirable light. As a community organization dedicated to well-being we see WE BIKE, etc. putting Greater Green Bay on the map and telling the story about our vibrant, active community to others across the country. Truly a bicycle built for well-being! Wello began eight years ago as Live54218, a local initiative to address childhood obesity, focused on increasing physical activity and healthy eating. Together with many community partners, local leaders, and advocates, they ignited efforts to enhance the health of our population. As their work continued, so has their understanding of what creates health for people and communities. A growing body of research combined with local, on-the-ground experience confirmed the importance of place and social determinants (the structural conditions in which people are born, grow, live, work and age) on our health and well-being. Health and well-being happen (or don’t) in our communities meaning your zip code can have a greater impact on your health, well-being and life expectancy than your genetic code. Place matters. They have adapted their strategic plan to better meet our community’s needs ensuring everyone can achieve their full potential by focusing on the root-causes of what creates equitable, healthy communities. Wello embraces local community context, traditions, and assets all while innovating for the future. Wello builds upon our past successes: a proven track-record of bringing collective strategies to scale and catalyzes the work of other individuals, groups and leaders. This emphasis on community organizing leverages the science of behavioral psychology, specifically how and why individuals make decisions, to improve the well-being of Greater Green Bay. Most importantly, to be effective, this approach demands an authentic equity lens. For this reason, they actively seek to connect with and amplify leaders and voices from all parts of Greater Green Bay’s diverse community. The difference between being a self-supported bicycle tourist and being without a home can be a very fine line. That is why we carry our house with us. Can you imagine reducing everything in your home to just fifty-five pounds of gear, and then living with that for months at a time? Surprisingly, everything we need to meet most of our daily needs can be carried in five small bags on our tandem. This may seem like an exercise in self deprivation to some. We get it, but we don’t see it that way. My yoga instructor once told me, “The more stuff you have, the more time you spend taking care of it.” When you only have two changes of clothes, you don’t spend much time worrying about what to wear. It’s freeing. Weight on the bike isn’t as big an issue as it is on your back, but it is still an issue. Especially over thousands of miles. With each step a backpacker takes he is lifting and lowering the weight on his back, an average of 2,000 times per mile. On the bike, the weight simply rolls right along, on level ground that is. The problem with weight on the bike comes in when trying to go uphill. For better or worse the world isn’t flat, and therein lies the problem. Weight on the bike has a profound effect on the effort required to pedal it uphill. When we crossed the Cascade Mountains on our first cross-country ride (“Coast to Coast on a Tandem“), we climbed for six and a half hours straight one day. Trust me, every ounce we carried counted. When bicycle touring, there is a delicate weight balance between want and need, safety and comfort. We often find ourselves way off the beaten path when bicycle touring. Because of this, we must be prepared to take care of ourselves in a wide variety of conditions. Water is usually our number one priority. Without water bicycling can get uncomfortable, and downright dangerous, quickly. We carry six 24-ounce water bottles with us on the tandem. That will generally last us for three hours. We used an additional water bag on parts of our Historic Route 66 ride in the southwest to double our water capacity because it was so hot, dry, and windy, and we were so isolated. Turned out to be a good idea. On the bike we can’t just walk to the kitchen for a glass of water. Protecting ourselves from the elements is our next priority. On the bike, we are fully exposed to the elements, sun, heat, wind, rain, cold, sleet, snow, you name it. If we get tired of the weather, we can’t always just go inside. Our clothing is the first line of defense against the weather. Someone once told me, “There is no bad weather, just bad clothing.” With the right combination of clothes, we can stay comfortable, or at least survive, in all but the most extreme conditions. It is not uncommon for us to experience temperatures below freezing and in the 90s on an extended bicycle tour. A light biking jersey, shorts, socks, Saranac bicycling gloves, and biking shoes work well in the heat. Layers like a long-sleeved synthetic zip turtleneck, biking jersey, fleece, wind-proof jacket, tights, socks (covered with plastic bags), glove liners, Saranac gloves, and biking shoes work well in the cold. When you have a very small closet you must pick your clothing carefully. The more ways you can use a piece of clothing the better. When you have a very small closet you must pick your clothing carefully. At night, or in an emergency, we have our three-season, two-person tent, sleeping pads, and down sleeping bags to keep us warm and dry. In bad weather, the tent can double as a storm shelter, kitchen for cooking, and a family room for reading, playing games, blogging, and watching movies, if we have connectivity. There is constant change on a bicycle tour. This can be exciting, but it can also become exhausting over long periods of time. Fortunately, our tent is always the same, small, but cozy. Eating is a big deal when you are bicycle touring. We have calculated that I burn between 5,000 and 7,000 calories a day. It is difficult for me to eat enough to keep from losing too much weight. We always carry snacks and at least one day’s worth of food with us on the bike. There are usually convenience stores and restaurants along our route, but sometimes not. Just like your car won’t make it far on “E,” without food, we won’t make it very far either. During the day, we snack constantly. At lunch time we stop at a restaurant, if we can find one, or make a peanut butter and honey sandwich along the road somewhere. Not elegant, but it works. When we are camping, we need to make our own meals, generally dinner and breakfast. Because of this we carry a small backpacking stove and fuel, two small pots, bowls, cups, knives, forks, and not much else. Breakfast is easy. Coffee for me, tea for Tracy, instant oatmeal with honey and nuts is our go too. Making dinner can be a bit more challenging because of the limited capacity of our kitchen supplies, including fuel. Quick cooking, one-pot meals with noodles, beans, tuna packets, and canned chicken work well. We can often supplement with fresh produce from a local market helping us with our nutrition, and to avoid food fatigue. A real problem on long tours. We almost always have one or two freeze-dried backpacking meals with us, just in case. Rounding out our fifty-five pounds of gear are things like a (1) smart phone, maps, toilet kits, first-aid kit, headlamps, wilderness survival bag (pocket knife, lighter, matches, fire starter, paracord, whistle, compass, space blankets, etc. ), and bicycle repair tools and supplies. Flat tires happen, but we also had a rear derailleur cable snap in the mountains of New Mexico along Route 66. When the cable broke, we were 60 miles from the nearest town, 280 miles from the nearest bicycle shop, and we hadn’t seen a car all day. We sure were glad we had an extra cable with us. Emotions and attitude play a huge part in the success or failure of any bicycle tour. Because of this, it is important to pamper yourself, at least a little bit. I don’t use a pillow to save weight and space. Instead, I wrap my clothes for the next day in my fleece and use that as a pillow. Tracy, on the other hand, needs to have her pillow. Or at least a small, stuff-able, synthetic and down camp pillow. Tracy is a big reader and always takes a book. I sure wish I could convince to read small paperbacks. She also brings hair gel and a dress, just in case we go out. Happy wife, happy life! Other “extra” items we carry include a small computer for blogging and movies, and lightweight hiking shoes for when we are off the bike. Whatever momentum we lose because of the added weight these items bring, we more than make up for with a positive attitude and increased energy. Self-supported bicycle touring isn’t like being without a home when you bring your house with you. Saranac is proud to be a family owned business with generations of expertise in glove design, development and manufacturing. Their commitment to innovation with uncompromised quality extends to all their categories – high performance athletes, weekend sports participants, hardworking industrial professionals, home and garden enthusiasts, winter sports lovers, motor sports devotees, and all fashion/multi-purpose needs in between. A proud supplier to the men and women in the armed forces. Their mission continues to be an unwavering pursuit of excellence through the innovation and creation of high quality, solution-oriented products, with commitment to charitable needs and relief efforts. Bicycling has been an important part of our lives for as long as I can remember. The benefits of bicycling have allowed us to lead a happy and healthy life. Our enjoyment has been enhanced over the years as we have become more skilled and experienced bicycling in just about any condition. Our three cross-country bicycle trips have greatly increased our level of skill and knowledge and surely will help us on our next great adventure. We are frequently asked, “Aren’t you concerned about your safety?” To answer this, you must first understand the difference between actual and perceived safety. Actual safety is based on what the data is telling us. For example, the crash data tells us how few crashes there actually are, what the most common types of crashes are and even what mistakes motorists and bicyclists make that cause these crashes. Perceived safety is how safe you feel. It is a gut check. For example, you may feel riding on the sidewalk is safer than riding on the road – this is actually an erroneous belief. Actual and perceived safety can present very different views. Unfortunately, perceived safety often trumps actual safety. What is the difference between a “crash” and an “accident,” and who cares? In professional bicycle and pedestrian safety circles we use the term crash. A crash is predictable and therefore preventable, like my crash. Typically, one of the individuals involved in a crash did something wrong. Education of motorists, pedestrians, and bicyclists can reduce the number of crashes. We, of course, are concerned about our safety. But, we are well-trained bicyclists and aware of the relative risks and the common mistakes that bicyclists and motorists make. We use our skill and knowledge to avoid these mistakes and keep ourselves safe. Like any sport or activity, the more skilled and knowledgeable you are the more you will enjoy the activity and the safer you will be. Many feel, if you can balance a bicycle you are good to go. That could not be farther from the truth. The League of American Bicyclists, the oldest bicycle advocacy organization in the country, has been offering a series of educational programs since the 1970’s. The core content is designed to reach people of all ages and abilities, improve skills, build confidence, and teach others. Smart Cycling, is taught nationally. I have completed the course and Peter is a League Cycling Instructor. Bicycling is not inherently dangerous. In 2016, there were 840 bicyclists killed in crashes with motor vehicles nationwide according to the National Highway Traffic Safety Administration. For comparison sake, approximately 30,000 motorists died in that same year. Peter and I have each traveled close to 100,000 miles on our bicycles, including 50,000 miles on our tandem all across the country, without a crash. That is until my crash last year. Remember crashes are predictable and therefore preventable. If just one person gets it right the crash will usually not occur. If the bicyclist is aware that a left turning motorists is one of the leading causes of crashes for an adult bicyclist, and is able to make an evasive maneuver, no crash! If a bicyclist runs a stop sign and the motorists sees them and stops, no crash! But, crashes do happen! I was hit by a car while bicycling on July 1, 2018. The motorist did not stop for a stop sign, failed to yield to me when turning left, and was issued two tickets. (See TERRY Article about crash)Even with my crash, I still believe the risk is worth the reward. With my knowledge and skill, I have a large degree of control over the risks that do exist. I am not going to lie to you, I have some work to do. It is not easy coming back from a crash, I second guess the risks and my bicycling ability. And, at the same time, I am dealing with the consequence of the crash, medical, financial, legal, etc. Fortunately, we have Jon Pinkert from Pinkert Law Firm to handle that part for us. My job is to get healthy and get back on my bike. Jon’s job is to make sure justice is served. I can’t wait to get back on our bicycle to see more of this amazing country. Hope you will come along for the ride! The Pinkert Law Firm attorneys are committed to providing prompt, efficient, and professional service to their clients. They are a full-service law firm. With a broad range of legal experience, their clients have access to advanced professional legal service – whatever the nature o their legal need. Their attorneys serve a wide range of clients. But they are more than attorneys. They are your neighbors, friends…. people who are proud to call northeast Wisconsin home. We are less than four months away from our fourth unsupported, tandem bicycle ride across the country, an endeavor which will take us approximately five months, cover around 7,000 miles, and bag us our last 21 states in the lower 48. Cool, right! We get asked this a lot, at our book events, on group bicycle rides, even at the bank, and the grocery store. It’s a thing. Ha! Simple answer: It must be love! Not enough for you? Didn’t think so. Maybe the best way to give you a feel for it is through a little Q & A.
Peter Q: Tracy, how long have we been married? Tracy A: Thirty-one years! Peter Q: Why did you agree to marry me? Tracy A: It is pretty simple, I loved you and thought we would have a good life together. Tracy Q: Kids? Peter A: Yup, two girls. Melissa, our oldest, is 28. She lives in Green Bay with her husband and is a School Psychologist for the De Pere School District. She loves to run and bicycle and is doing her first triathlon later this year. Alex(andra) is 23 and currently living in Haiti. She has a degree in Environmental Science and works for an environmental nonprofit. She is a scuba diving instructor and, besides teaching, is working to reestablish local coral reefs. Fun fact: Both girls were two-time Division 1 state pole vaulting champions in high school and went on to compete for the University of Minnesota. Go Gophers! Proud parent moment. Tracy Q: What do you do for a living? Peter A: I am a national pedestrian and bicycle safety consultant. Our business, WE BIKE, etc., LLC, specializes in the areas of engineer, education, enforcement, and encouragement for walking, bicycling and healthy communities. 2018 was our 25th anniversary. Thanks for joining the family business four years ago. Peter Q: You? Tracy A: I have 30 years of municipal government experience, serving as a Parks and Recreation Director, and Administrator for several communities. It was exciting and a challenge to help make communities more bicycle and pedestrian friendly. In 2014, I resigned from my Administrator position in the Village of Allouez to bicycle across the country and work full-time in the family business. Peter Q: When and where did you start bicycling? Tracy A: I learned to bicycle as a child in Wauwatosa, Wisconsin. I remember enjoying the speed and thrill of my first ride. Tracy Q: How about you? Peter A: I learned to ride as a kid in Minnewashta, Minnesota, but I didn’t really get into it until I did my first triathlon while in college. That was just before we met at Blackhawk Lake Recreation Area in Iowa County, Wisconsin. Peter Q: My first bicycle was an old red hand-me-down beater, probably from Montgomery Wards. What was your first bike? Tracy A: I think I probably rode one of my brothers’ old bikes first, but eventually I got a true “girls” bicycle. It was white and purple, had a banana seat, and purple steamers hanging out of the high-rise handlebars. Peter Q: Why do you like to bicycle? Tracy A: Bicycling is very relaxing for me. I used to commute to work and after a long, hard day at work nothing was better than hoping on my bicycle to ride home. It helped relieve the stress of the day and clear my head. Tracy Q: How about you? Peter A: It’s the sense of freedom I feel, being out in the elements, and knowing I am getting where I’m going under my own power. Peter Q: What is the farthest you have ridden in a day? Tracy A: That would be 157 miles on our tandem. An epic ride from Bismarck, North Dakota almost all the way to Fargo, North Dakota. Peter Q: Have you ever been injured on a bicycle? Tracy A: Unfortunately, yes. On July 1, 2018, I was hit by a car when the driver failed to stop for a stop sign and then didn’t yield to me while turning left. I suffered a concussion, whiplash, right leg soft tissue damage, and a complex tear in the medial meniscus in my left knee. The driver was given two tickets. Tracy Q: You? Peter A: Nothing serious like you. I did get caught up in a pace line crash once. Someone at the front of the line hit his brakes and a bunch of us went down. Torn brand-new jersey and some road rash, but I was otherwise fine. Remember how the girls cried when I walked in the door after the crash? Then there was the time I hit the joint line with the tandem and laid us down at 25 mph. Sorry about that, but the matching road rash was kind of funny. Peter Q: How is your recovery going? Will you be ready for our next trip?Tracy A: I have been training for our next trip and is it going pretty well, although I notice my knee gets sore after a long workout and I need more time to recover. I continue to do my therapy which helps to strengthen the knee and the supporting muscles. I am hopefully my training will allow me to put in the long days on the bicycle. Although, we can always ride less miles each day or take more days off to make is easier. Tracy Q: How long have we been riding a tandem together? Peter A: Let’s see, we got our first tandem, the Trek T-100, when Melissa was about five so, about 23 years. Where does the time go? Peter Q: Why did you start riding the tandem? Tracy A: I started riding the tandem when training for my first century (100 miles). I wanted to ride 100 miles but was not sure I wanted to tackle it on my single and asked you to do it on the tandem with me. Peter Q: Where do you ride on the tandem, back, front? Do you like it there? Why? Tracy A: I ride on the back of the tandem. I enjoy riding on the back because I can look around more and you serve as my wind and bug shield! Peter Q: Do you ever get scared riding on the back of the tandem? Tracy A: Sometimes when we are going downhill really fast and the road is winding. Peter Q: Have you ever driven (captained) the tandem? Tracy A: Yes,I have but only when we are not fully loaded for a tour. I do not mind being the captain but it is a lot of work for me. Tracy Q: Why do you like to ride the tandem? Peter A: To me, it’s like a perfect partner dance. When we are in sync, which is most of the time, we ride like one. It’s when I feel closest to you. Peter Q: How about you? Tracy A: It is just fun and I enjoy the challenge of making the tandem move. Also, being that in sync with you brings us closer. Peter Q: How did you get started bicycle touring? Tracy A: When we completed the Door County Century on our first tandem, I wanted to try riding multiple days on a tandem. That’s when we bought our road touring tandem, the 2000 Santana Arriva. Peter Q: What is your favorite thing about bicycle touring? Tracy A: Besides all the people we meet and the acts of kindness we receive; I would say the thrill of experiencing the world from the seat of a bicycle. The experience is much more intimate, you see, feel and smell the world as you bicycle along. Amazing! Tracy Q: What is your favorite thing? Peter A: There are a lot of things, but if I have to pick just one, it’s the people. I would estimate we have made at least a dozen life-long friends through our bicycle touring adventures. Seems like a pretty good return on investment to me. Peter Q: What is your least favorite thing about bicycle touring? Tracy A: When I get us lost. I’m the navigator. It is stressful and typically ends up with us going at it. Tracy Q: What’s your least favorite thing? Peter A: Not being able to take a shower before I crawl into my nylon sleeping bag at night. It has only happened a couple of time in all our years of touring but, it is disgusting. Peter Q: I know you have different things that are hard for you. What are they? Tracy A: I am the navigator, which does not come naturally to me. I really have to work at it and concentrate to keep us moving in the right direction. I also get lonely on our trips, which seems silly because you are only six inches away from me. I sometimes miss my family, friends, and my cats. Tracy Q: What was your favorite moment bicycle touring? Peter A: I loved riding for hours though the wheat fields in North Dakota on our Northern Tier ride and watching the wind play with the grain. Peter Q: Different for you, right? Tracy A: Petrified Forest National Park on Historic Route 66 near Holbrook, Arizona was my favorite. The 28-mile road that takes you through the park offers amazing views. Peter Q: What do you love most about touring on the tandem with me?Tracy A: Every morning I look forward to getting up with you and starting a new day. I love getting on the bicycle and can’t wait to discover what the day will bring us. Tracy Q: What do you love most about touring on the tandem with me?Peter A: I always have my best friend with me. Peter Q: When, and where is our next bicycle trip, and whose fault is it?Tracy A: It was my idea. When I realized we only had 21 states to bicycle through to ride in every state in the contiguous 48, I thought we should go for it. See what you started! Tracy Q: What are you looking forward to most on our next bicycle trip?Peter A: Riding new roads, seeing new sights, meeting new people, and hanging out with you. Happy Valentine’s Day everyone. May you all find love. 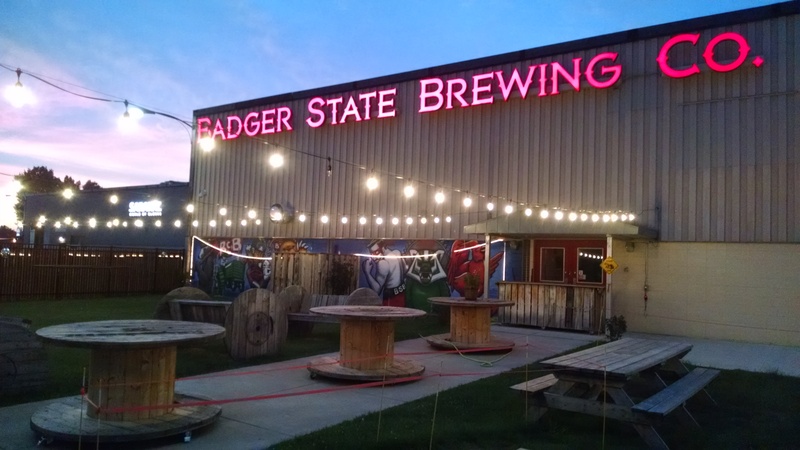 Badger State Brewing Company is an award winning destination craft brewery, tap room, beer garden, and upscale event hall located in the Lambeau Field Stadium District. Featuring a beer-only Tap Room with 24 beers on tap that are all from the state of Wisconsin. The brewery also cans and bottles a variety of beers on site as well. Facilities also include an outdoor beer garden as well as The Barrel Haus, an event hall capable of hosting wedding receptions, tailgates, and corporate events. Growler and Crowler sales are available during tap room hours. Ticketed tours are offered on Saturday’s – via the event page for a ticket link and more info. We do not serve liquor or wine. We will be posting regularly to our social media channels leading up to and during the trip itself. Like and follow us for the latest updates. We couldn’t do this without the support of our partners. Thank you for investing in us and our cause. You’ve heard the sayings, “You are what you eat” and “Food is fuel.” Well, they are true! Tracy and I have been athletes all of our lives but never gave nutrition much thought. Sure, we ate our fruits and veggies like our Moms told us. We even knew carbohydrates give us quick energy and protein rebuilds muscle, but that was about it. Our nutrition had always seemed sufficient. We started bicycle touring in the early 90s and never had any significant nutritional issues. So we thought. 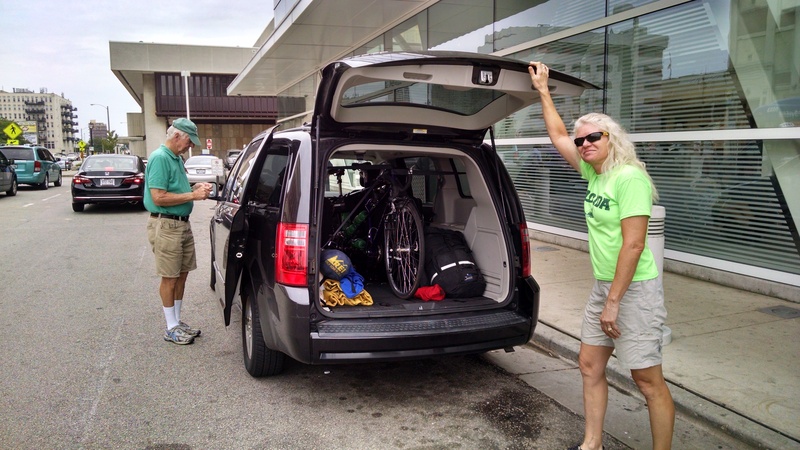 Then we did our first unsupported cross-country bicycle trip in 2014 and the, figurative, “wheels” almost came off. Bicycle touring is a joy for us, but it certainly isn’t without significant efforts. There are headwinds and hills, not to mention the toll that riding “fully-loaded” day after day can take on your body. Forty-one days into our self-supported, 4,362-mile, 72-day tandem bicycle trip across the Northern Tier of the USA, we stopped home in Green Bay, Wisconsin and weighed ourselves for the first time. We had both lost about five pounds. We were lean when we started the trip and were concerned that any more weight loss would affect our strength and, ultimately, our ability to ride. We started to eat everything in sight. In my case, that included large amounts of chocolate-covered mini donuts. Mmmm. By the time we reached New York State on day 56, we were struggling. We were hungry all the time, or not at all, couldn’t get enough food, and were craving sugar and fat. What really scared us though was having trouble getting up in the morning, losing our ability to concentrate, less power in our legs, and fatiguing more easily. On top of that, I was getting cranky and starting to lose my nerve. Not good for the guy driving a fully-loaded tandem. What the Hell was wrong with us! In 2015 we bicycle the length of the Mississippi River. Although we completed the trip, we experienced many of the same issues we had the year before. We started to suspect that our problem might be partially nutritional. What we didn’t understand at the time was that extreme efforts require extreme nutrition. Before our trip along Historic Route 66, in 2016, we contacted Performance Nutrition Specialist Lee Hyrkas RD, CDE for help. Q: Lee, what is your background as a Nutritionist? I’m a registered dietitian, certified diabetes educator, and performance nutrition specialist. I’ve been working in the field for five years. My average week entails working with a variety of different clientele, including athletes, fitness enthusiast, weight loss focused clients, and individuals with diabetes. My passion for sports nutrition developed during my years as an athlete and my time in college. I was fortunate enough to be a student assistant strength coach at the University of Wisconsin-Green Bay. This experience enabled me to apply my knowledge of nutrition to high-level athletes. Q: What nutritional evaluation did you do with us? Peter and Tracy both went through a comprehensive assessment of their training routine, nutrition regimen and overall goals. A food diary analysis and determination of caloric needs was also completed. We discussed food preferences and food habits at home versus on tour. The comprehensive assessment provided Peter and Tracy with details on nutritional deficits and missed fueling opportunities. Q: What were the results of our nutritional evaluation and what did that tell you about our nutritional needs? The most concerning finding from Peter’s and Tracy’s evaluations were their foods journals revealing a 400-500 calorie deficit most days of the week. This equates to roughly a 3500 deficit for the week! Peter and Tracy were spending a lot of time on the bike and cross training, but their fueling plan wasn’t matching that workload. Additionally, we discovered that protein needs were likely inadequate, leading to longer recovery times. I also noticed a heavy reliance on sport bars for snacks and exercise fueling. We discussed energy bar alternatives (energy bites, trail mixes, smoothies, etc.) to keep their meal plan balanced and taste buds satisfied. Q: How do the nutritional need for a recreational rider, racer, bicycle tourist differ? Depending on the client’s goals, nutrition considerations will vary greatly between a recreational rider, racer and tourist rider. Recreational riders often need fewer calories and carbs compared to racing and tourist cyclists. The main goal for a recreational rider is to keep things balanced. Due to the intensity of racing events, it’s best for these athletes to focus on more simple carbs (sports drinks, gels, dried fruit, gummy bears, etc.) during events. Simple carbs tend to digest more easily and produce quick bursts of energy. In contrast, tourist cyclists tend to perform better with a mix of simple and complex carbs (bread, bagels, oatmeal, potatoes, noodles, etc.). Since tourist cyclists are often riding at a more moderate pace, their stomachs can tolerate protein and fat better than racing cyclists. Q: How do Tracy’s nutritional needs differ from mine? Due to Tracy’s body size, gender, and hormonal differences, her calorie and protein needs were lower than Peter’s. Also, females tend to burn more fat during submaximal exercise. On a day to day basis, I find that certain females perform better with slightly lower carb intake and higher fat intake. Experimentation is key. Q: What were the strategies you recommended for us during training? While on a tour? As Peter and Tracy started to ramp up their training, our number one goal was to trial new fueling strategies. Experimenting during training helps ensure that the body will react well during an event or tour. As for hydration, Peter and Tracy have done an excellent job at having a generous amount of water bottle holders on their tandem. I recommended developing a consistent hydrating pattern on the bike and alternating between water and sports drinks. It’s best to take sips of fluid every 10-15 minutes of moderate to intense exercise. Most individuals can tolerate a maximum of 33 oz. of fluid per hour of exercise. Over consuming electrolyte rich beverages can lead to GI issues (gas, bloating, nausea, etc.). This is why alternating with water is key. After workouts or during breaks on the road, I encouraged Peter and Tracy to hydrate with nutrient rich fluids such as chocolate milk, 100% juice or smoothies. Warm chicken broth can also make a nice treat along the way. Peter and Tracy just needed to find the right food pairings to unlock their bodies’ athletic potential. Another key area that we worked on was creating a mental checklist of food groups that should be included at meals and snacks. I guided Peter and Tracy on setting up sample meal and snack ideas that included the proper mix of protein, carbs and fats for performance and recovery. We discussed food combinations that might be more accessible on the road (energy bites, trail mixes, string cheese with fruit, bagels with nut butter, etc.). Peter and Tracy just needed to find the right food pairings to unlock their bodies’ athletic potential. As I mentioned earlier, both Peter and Tracy had some work to do on adding in protein rich foods more consistently. Endurance athletes often require 0.5 – 1 gram per pound of protein per body weight per day. For example, a 170 lb. rider would need at least 85 grams of protein per day. I often find ~0.7 grams to be a sweet spot for a lot of athletes. We worked on spreading their protein intake over 4-6 meals/snacks in a day. This spacing aids in proper protein utilization, reduced muscle wasting and enhanced recovery from exercise. We also worked on scheduling protein rich meals before and after their workouts. On tour, we discussed simple protein options to grab from convenience stores (string cheese, Greek yogurt cups, cottage cheese cups, chocolate milk, boiled eggs, nuts, jerky, etc.). A benefit of Peter and Tracy focusing on their calorie intake and meal composition, was ensuring adequate amounts of vitamins (A, D, C, E, K, B vitamins, etc.) and minerals (sodium, iron, potassium, magnesium, calcium, etc.) were consumed. Under-fueling and unbalanced meals are precursors for nutrient deficiencies. Although a multivitamin can help in this area, it shouldn’t replace a well-balanced fueling plan. Instead, think of a multivitamin as an insurance policy for days that your fueling plan isn’t perfect. Remember to check off those fruit and veggies frequently at meals. The vitamins and phytochemicals in produce may improve your recovery time and fight unwanted illness. Whole grains, lean protein and healthy fats will provide the rest of the essential micronutrients. I believe one of the most successful pieces that Peter and Tracy implemented, was consistency in meal timing. Peter and Tracy began fueling their bodies’ every 2-4 hours. We also focused on scaling meal portions up or down depending on their training demands week to week. This helped Peter and Tracy recover faster and maintain their goal weights more easily. Many active individuals miss this piece of the puzzle. One major issue that many endurance athletes run into is taste fatigue. Taste fatigue occurs when an individual eats the same food/beverage over and over again. This can happen at meals or during a long tour. My number one piece of advice to prevent this is to find food pairings that stimulate different taste buds. For example, sweet and salty combinations often work well (fruit with cheese, dates filled with salted almonds, jerky with dried fruit, etc.). Further, I encouraged Peter and Tracy to keep a variety of protein, carb and healthy fat options around the house. This helps prevent eating the same meal/snack over and over again. We want our taste buds to look forward to our next eating opportunity. On tour, Peter’s energy needs ranged from ~5000-7000 calories per day. Tracy in the stoker position, had an impressive output of ~4000-6000 calories per day. After we reviewed the findings of their food diaries, Peter and Tracy realized that we needed to calculate their energy needs more accurately to prevent declines in performance and mental fatigue during their upcoming tour. On tour, Peter’s energy needs ranged from ~5000-7000 calories per day. Tracy in the stoker position, had an impressive output of ~4000-6000 calories per day. You can see why it’s so easy to unintentionally lose weight on tour. A simple technique to estimate your calorie needs is to take your body weight in pounds and multiply it by 11. This will provide you with your resting metabolic rate (RMR). Now we will take our RMR and multiply it by an activity factor. Below, are guidelines. Again, this is an estimate and will need to be adjusted to each individual. 170 lb. individual x 11 = 1870 calories x 1.8 = 3,366 calories per day. One of the most challenging aspects of working with Peter and Tracy was the availability of nutrition on their tour. Peter and Tracy could only pack so many items on their tandem, so they were at the mercy of what the convenience stores or restaurants had to offer. This is where you have to have the mindset of doing your best with what you’re given. We discussed several on the go options for each food category. This knowledge enabled Peter and Tracy to make the best choices possible in each situation. Lee and I have a running joke about chocolate-covered mini donuts. Q: Where do the chocolate-covered donuts fit in? Q: How can people contact you if they want more information or a personal nutritional evaluation? Individuals can contact me by email (HyrkasRD@gmail.com). My number one goal is to assist athletes and active individuals in maximizing their health and performance. Armed with the nutritional knowledge we gained from Lee and the strategies he taught us, our 2016 tour along Historic Route 66 was one of our best. We are feeling more than prepared for our next great adventure later this year. 7,000 miles in five months. Our route will take us from Washington State in June east across the middle of the country to the eastern seaboard where we will ride from Massachusetts to Florida, Alabama and Mississippi, ending in New Orleans, Louisiana in late October. This will be our longest trip yet and will cover our final 21 states in the lower 48! WE BIKE, etc. 2019 Bicycle Adventure: Let the Training Begin! When we tell people about our next bicycle adventure they often say something like, “How do you train to bicycle 7,000 miles in five months? That’s nuts!” Maybe, maybe not. First of all, we don’t train to bicycle 7,000 miles, it’s just too daunting a task. Instead, we simply train to go for a bicycle ride every day until we get there, wherever “there” may be. We know people who have bicycled across the country, and farther, and not trained at all. It is doable with the right motivation but, it will definitely be painful. Ouch! Even if you do train, at some point in a long tour you run out of what you had (strength and conditioning) and must rely on what you have left. Ultimately, it is mostly mental. If it’s mostly mental then why train? Training keeps us physically and mentally strong year round. I find training is particularly helpful at staving off the winter blues and weight gain that inevitably accompany our long Midwestern winters. Some of the best winters we have had in Wisconsin were training for a spring marathon or a long bicycle tour. Being physically fit early in a bicycle tour also gives us more options and keeps us safer. We often have to decide between riding, say 30 miles, to find food and lodging, too short, or riding much further, 80-100 miles, to the next town. Being in great shape allows us to bike the bigger miles we often need to accomplish our goals. Having the reserves to put in more miles can also get us out of a jam. More than once we have rolled into a rural town only to discover that the services we need are closed, full, or even gone. I guess we’ll just keep riding. Did I mention that bicycling across the country isn’t easy? We didn’t just wake up one morning and decide to bicycle across the country. We have spent years building up to this trip, although we didn’t know it at the time. I stated bicycling longer distances in the mid-80s so I could try a triathlon, but it wasn’t until the mid-90s that we started riding longer distances as a couple/family. Our first rides were around the country block near our home in Green Bay after Tracy got done with work. As our fitness improved, and we became braver, we started taking longer and longer rides. Five miles, 10 miles, 50, 100. We eventually started bicycle touring, an easy transition because we both grew up camping. Overnight, one day, one week, two weeks. 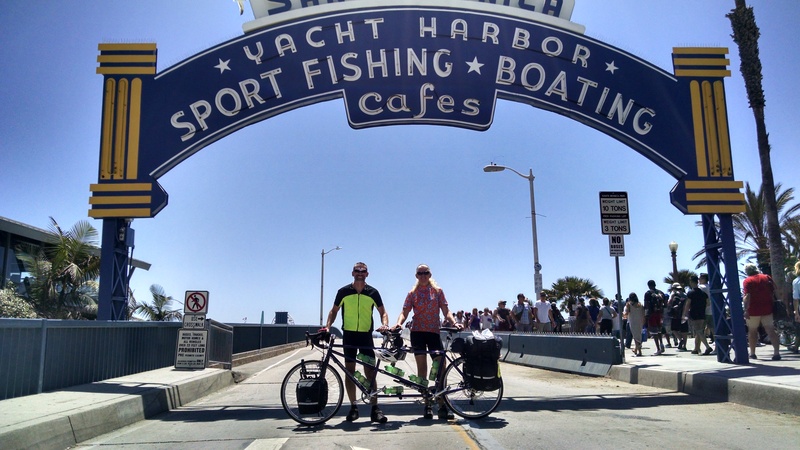 By the time we completed our first three-week bicycle tour we figured we could probably make it across the country if we just strung three-week tours together. Easy, right! Our first cross-country bicycle trip was along the Northern Tier of the USA in 2014. (See our book “Coast to Coast on a Tandem”) That trip started in Bellingham, Washington and ended in Bar Harbor, Maine 4,362 miles and 72 days later. In 2015 we rode the entire length of the Mississippi River, and then some, 3,052-miles, and in 2016 we bicycled Historic Route 66, (Green Bay, WI – Chicago, IL – Santa Monica, CA), 2,603 miles. When Tracy was 50 she decided to run her first half marathon and asked me to train her. Having run several marathons, myself, I agreed. The first week we ran a mile and Tracy thought she was going to die. The second week we ran two miles and, again, Tracy thought she was going to die. On the third week, after running three miles, Tracy once more said she thought she was going to die. I said, “Exactly, see how this works.” Ha! 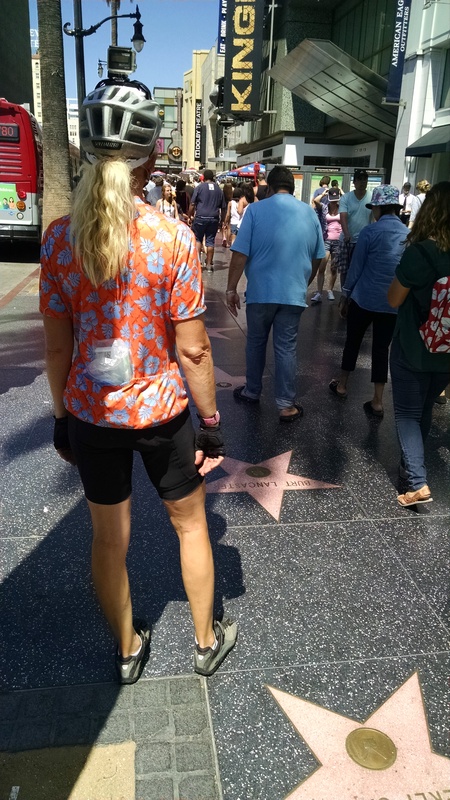 Tracy now has three half marathons and three unsupported cross-country bicycle tours to her credit. I don’t know about you but I’m impressed. Are you starting to understand why I have her on the back of our tandem, this woman is an athlete. I have been an athlete all of my life, but at age 45 I had surgery to repair a torn meniscus in my left knee. As part of my recovery I worked with a professional trainer to help me get my strength back. Working with the trainer I suddenly realized that if this person could help me recover from an injury, just imagine what she could do if I was healthy. Tracy and I now consult regularly with a trainer to help us meet our, often crazy, goals. We haven’t found our limit yet. We cross train to prepare for our trips. To move the tandem, we need to be strong. The total weight of the bike, our gear, and ourselves is approximately 400 pounds. To build our strength we weight train. We normally spend 6-8 hours a day in the saddle, a typical work day. To build our endurance we train aerobically. We bicycle, of course, but we also walk, run, and use various pieces of aerobic equipment at the gym, especially in the depths of winter. Finally, we work on our balance and flexibility to make ourselves more efficient on the bike and to help prevent injury. We can’t completely simulate the challenges of riding a fully-loaded tandem 75 miles a day, 6 days per week (on average) in all kinds of weather and terrain, but by mixing up our training methods, we can give ourselves a good start. In a typical week we stretch, weight lift, run, bike, and yes, even rest. We spend about 6 months training for a cross-country bicycle tour. Early in our training we emphasize stretching and strength, stretching most days, lifting three days a week and doing aerobics two days a week. Our weekly workout time is about eight hours. By the middle of the training cycle we are about evenly split between strength and aerobic training and work at it about 16 hours per week. At the end or our training, we are bicycling six days a week and lifting two for a total workout time of approximately 24 hours. (Love our Saranac bicycling and weight lifting gloves.) It is a huge commitment but well worth it, for us. Someone told me once that by the time you can run 13 miles in training for a marathon, you probably have the endurance you need to complete a full marathon. The rest of the training is mostly to teach your body and mind to deal with the pain. By the end of our training for a long bicycle trip, Tracy and I don’t feel pain the same way casual bicyclists do. Thank goodness. It can be hard to fit all of this training in. One trick we have learned is to incorporate our training into our daily lives. We seldom drive our cars if we don’t have to, instead we walk to the convenience store (1.6 miles, 30 minutes), run to the post office (2.4 miles, 22 minutes), or bike to Badger State Brewing Company (6.6 miles, 40 minutes) for a beer. Give it a try. On July 1 of this year Tracy was hit by a car while riding her bicycle. Not her fault. She had a concussion, whiplash, bruising to her right leg and back, and a torn meniscus in her left knee, which required surgery on August 13. (Thank goodness for her Road iD and Pinkert Law Firm.) Needless to say, Tracy’s training looks a little different for this trip than in past years. From the middle of August through the end of December, Tracy was limited to physical therapy exercises for her knee, some easy exercise bicycling, and limited upper body weight training. She is now cleared to resume all normal activities, except running. Because of Tracy’s injury, athletic abilities, and the rigors of our “normal” training, her surgeon has been very cautious with her recovery. The goal is to have her back to bicycling at 100 percent by mid-May. Because of her running limitation, Tracy is using our gyms aerobic equipment and walking more. Fortunately, bicycling is the number one recovery exercise for Tracy’s type of injury. She should be good. Safety tip: Always walk and run facing traffic and bicycle with traffic when on the road. It’s safer, it’s courteous, and it’s the law! All of this training and the tour itself burn lots of calories and require extreme nutrition to meet the extreme demands. I typically burn between 5,000 and 7,000 calories a day during a bicycle tour. To find out how we meet these challenges watch for our next blog. We will be posting regularly to our social media channels leading up to our trip and during the trip itself. Like and follow us for the latest updates. Tracy and I are going for another “little” bicycle ride and we hope you will follow along. In 2019 we will be riding our tandem bicycle (“Violet”), unsupported, across the country as before, but this time there will be some twists. First, we intend to ride way more miles, approximately 7,000 over five months. Our route will take us from Washington State in June east across the middle of the country to the eastern seaboard where we will ride from Massachusetts to Florida, Alabama and Mississippi, ending in New Orleans, Louisiana in late October. This will be our longest trip yet and will cover our final 21 states in the lower 48! The second twist is that we will be riding for a cause, “bicycle safety.” We will be sharing our daily adventures on social media as before, but we will also be sharing safe bicycling and driving tips. Finally, we will be encouraging our followers to support local, state and national non-profit bicycle safety organizations. Motorists and bicyclists, we can all do a better job! Tracy and I have dedicated our personal and professional lives to promoting safe and enjoyable bicycling for the past twenty-five years, so this just kind of makes sense. Our company, (WE BIKE, etc., LLC) specializes in the areas of Engineering, Education, Enforcement, and Encouragement for walking, bicycling and healthy communities. But, there’s an even more personal reason as well. On July 1 of this year Tracy was hit by a car while bicycling, just three miles from our home. Tracy had the right of way, but the motorist ran a stop sign. This was her first crash in over 100,000 miles of riding, including three, unsupported, cross-country trips. Tracy who was wearing a helmet, bright yellow vest and gloves, sustained a concussion, whiplash, bruising to her right leg and back, and a torn meniscus in her left knee, which required surgery on August 13. When the motorist got out of her car to check on Tracy she said, “I didn’t see you.” Really? Tracy has been doing a lot of physical therapy and was finally cleared to start bicycling again on September 28 (my birthday). She is getting stronger every day and is expected to make a full recovery (minus a bit of meniscus). She was really quite lucky! This is not our first major bicycle ride on the tandem. In fact, it is becoming kind of a thing for us. Our first cross-country bicycle trip was along the Northern Tier of the USA in 2014. That trip started in Bellingham, WA and ended in Bar Harbor, ME 4,362 miles and 72 days later. In 2015 we rode the entire length of the Mississippi River, and then some, 3,052-mile, and in 2016 we bicycled Historic Route 66, (Green Bay, WI – Chicago, IL – Santa Monica, CA), 2,603 miles. We took 2017 off from extended bicycle touring but we wrote a book. “Coast to Coast on a Tandem: Our Adventure Crossing the USA on a Bicycle Built for Two” chronicles our 2014 trip across the Northern Tier of the USA. This book, written from both of our perspectives, and based on our actual trip blog and Facebook posts, will give you a good feel for what we will be up against, both physically and personally, during our upcoming adventure. The book is available through WEBIKE.org and Amazon.com. Starting today we will be posting regularly to our social media channels about our next trip. Leading up to the trip we will talk about Tracy’s recovery, training, nutrition, route planning, equipment, our partners, and the multitude of other things that go into making this a reality. During the trip we will do our level best to make you feel as though you are right there with us and to give you opportunities to interact with us directly. Have a question? Ask. There are no bad questions and we appreciate the company. It can get lonely out there. Please Like and follow us for the latest updates. We will be highlighting each of our partners in later blogs. We were excited to get going this morning because we knew we would complete our bicycle ride today. Although we only bicycled 39 miles it was all urban riding with lots of traffic to share the road with. The drivers were good but it still was a challenge and you really had to pay attention. 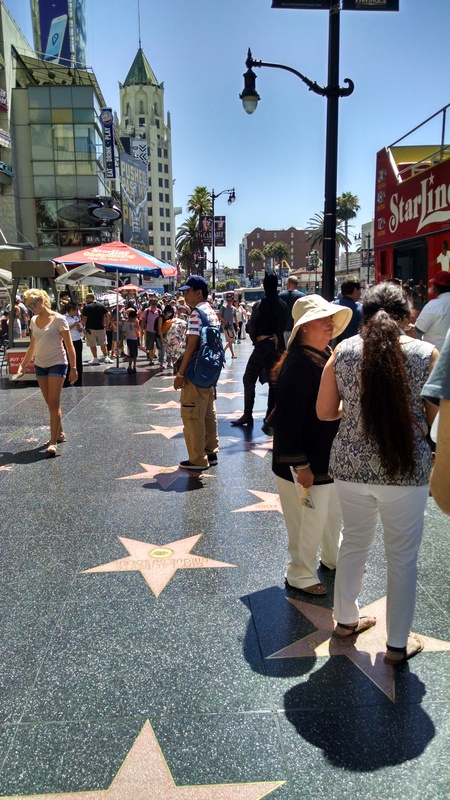 We took a slight side trip to the Walk of Fame and had a chance to see many of the stars along this famous roadway. Unfortunately there were also thousands of others looking at the same stars and it was difficult to get thru with a fully loaded tandem. We didn’t stay long and soon were on the road again. Unfortunately a couple of miles later Tracy said the back tire feels weird, so we stopped to checks it out. Yes, the sidewall on the tire was failing and we needed to stop and put a new tire on. So about 7 miles from our end point we were fixing our tire, right next to a Starbucks store!! On the road again and a great ride thru Beverly Hills, amazing homes in this area. We then dropped down to Sunset Boulevard, Broadway and Ocean for our final push to Santa Monica. The ride down Broadway was very nice with a bicycle lane and slower moving traffic. 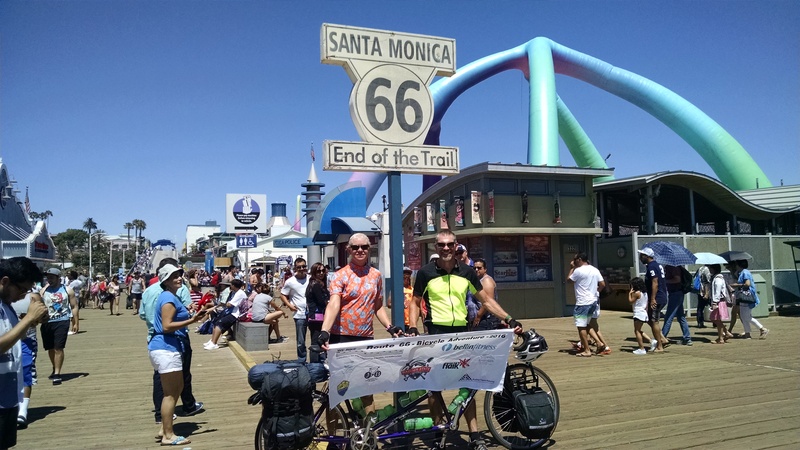 We finally hit the end at the Santa Monica Pier – YEA!! We were very excited and enjoyed the limited time we had on the pier. Between the traffic and tire repair we got to the end much later than planned and our ride was to arrive between 2:00 and 3:00pm. So we had 45 minutes to explore and get our pictures. A childhood friend of Tracy’s – Rick was picking us up and taking us to his place to spend a couple of days. Rick lives in Riverside about 90 miles from Santa Monica and was in Santa Monica for work and agreed to pick us up and save us a 90 miles ride back to his house – YEA Rick!! We are glad to be done with the trip but enjoyed meeting all the people and seeing some amazing sites. 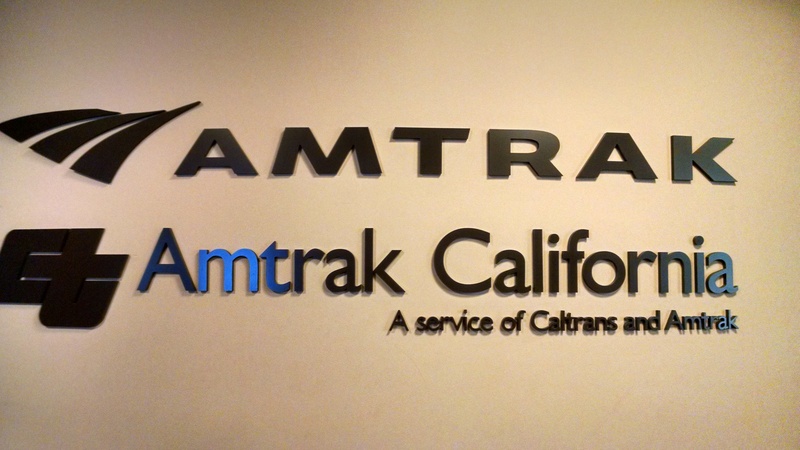 We will take Amtrak back on Tuesday and arrive back in Green Bay the evening of July 28th. Thanks for following our blog, we hope you enjoyed it. Plans are to do a presentation on this trip at Badger State Brewery in the next couple of months – watch for more information in the future.